As I have already stated, I often found myself instinctively holding the K-01 to my eye, only to remember that there is no optical viewfinder. Neither is there the option to add an electronic viewfinder to an accessory socket. Considering there is a lot of blank space on the minimalist body of the K-01, and that it already has a raised bump on the top plate for the pop-up flash and hotshoe, I find it surprising that an EVF, or at least the option for one, has been omitted. The size and shape of the K-01 almost cries out for an EVF, and when you consider that there are smaller compact system cameras available that include a built-in EVF, I consider it a major omission. 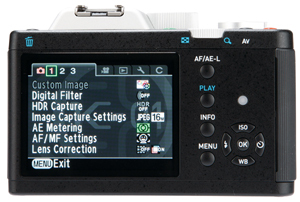 One of the reasons I believe a viewfinder is necessary is because the K-01’s screen is very reflective. In bright sunlight, I struggled to use the screen to compose my images. On a number of occasions I had to take images almost blind and then shade the screen with my hand to review them before attempting to recompose. Increasing the screen’s brightness helped a little, but it could still do with a better anti-reflective coating, especially as the lack of a viewfinder means that the screen must be relied upon. Like most other new cameras, the K-01 records full HD video at 1920×1080 pixels, with three different quality settings: good, better and best. Footage is saved in the MPEG-4 format using H.264 compression. Sound is recorded in stereo, and there is an external mic input, as well as HDMI output. Video footage looks very good, but when using AF the lens searches back and forth, which obviously looks awful when recorded, so I would recommend manually focusing. When using a large lens, such as the 16-50mm f/2.8, using the large manual-focus ring to focus works well and feels as good as on any DSLR. As well as being able to adjust the exposure compensation when shooting video, there are also options to use aperture priority and manual-exposure modes, which makes the K-01 a useful tool for videographers. There is also that wealth of exotic K-mount lenses at reasonable prices, and the fact that many of these older lenses are manual focus will make no difference when shooting video, given that it is the preferred focusing method.